Out of the Red Sea, ticked off Aden and Sana'a, now in Al Mukalla. Chief blogwriter has been under the weather with a sorethroat and head cold so there's lots of catching up to do! The weather gods were kind to us for our voyage out of the Red Sea. We were the last to leave the anchorage, at dawn rather than in the early hours (Wednesday 20th February). 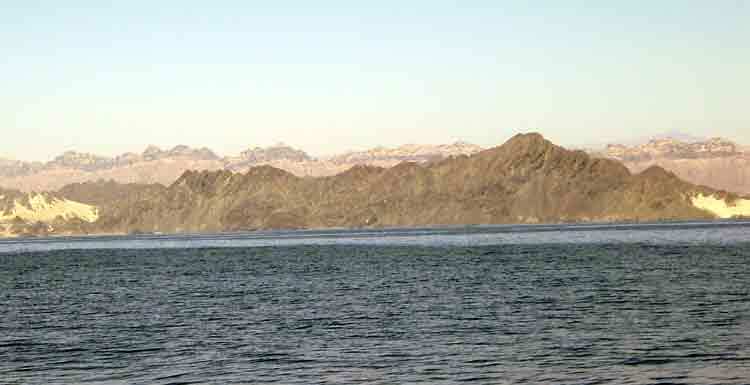 The wind picked up at mid-day, unusually from the north, so we sailed across the shipping lanes and through the small strait north of Perim island at Bab el Mandeb. 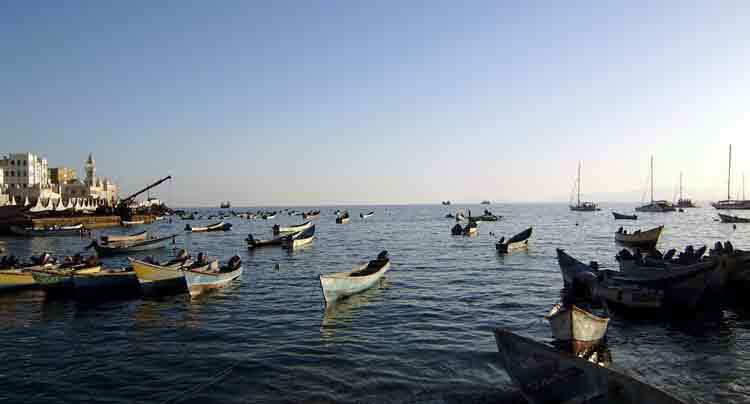 The area is a popular fishing ground and we had our first experience of Yemeni fishermen buzzing around in their long, high prowed boats powered by large outboard motors. Most were full of men, some with their children, waving as they passed by. Once into the Gulf of Aden the wind dropped so we motored on through the night, heading east for a change. There were a few big ships around and in the early hours we were called up by the coastguard, checking who we were. The next day we enjoyed the scenery along the coast, which is mountainous with many extinct volcanos and lava fields, but the cloudy skies made photography difficult. 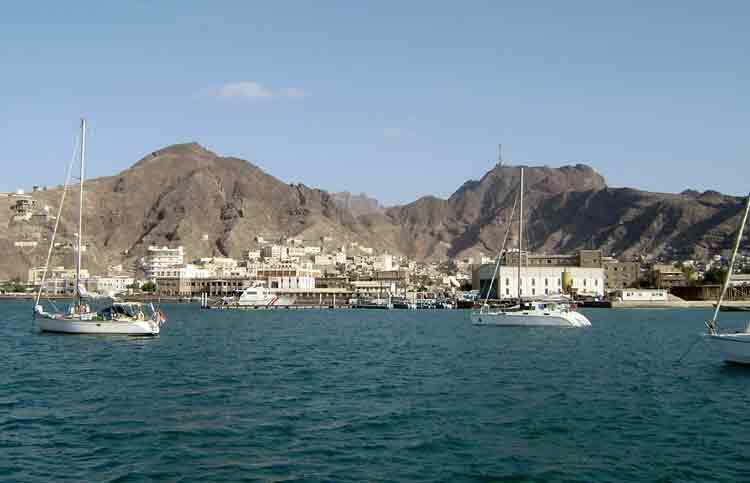 We stopped for the night 20 miles short of Aden, anchored in the lee of an extinct volcano, having picked up a fresh cuttlefish for supper from a passing fisherman. Our anchorage was popular with local families who came out from the nearby village in their boats to have Thursday afternoon picnics on the shore, so not exactly peaceful. After supper we heard a commotion outside the boat and eventually went on deck to find our visitors were a coastguard patrol. They didn't speak much English but we gathered they wanted us to proceed to Aden immediately. We pleaded tiredness and eventually they capitulated, dropping anchor nearby and watching over us all night! In the morning we noticed a larger coastguard boat was also anchored in the bay not far away. After breakfast we moved on, with a cheery wave from our minders. 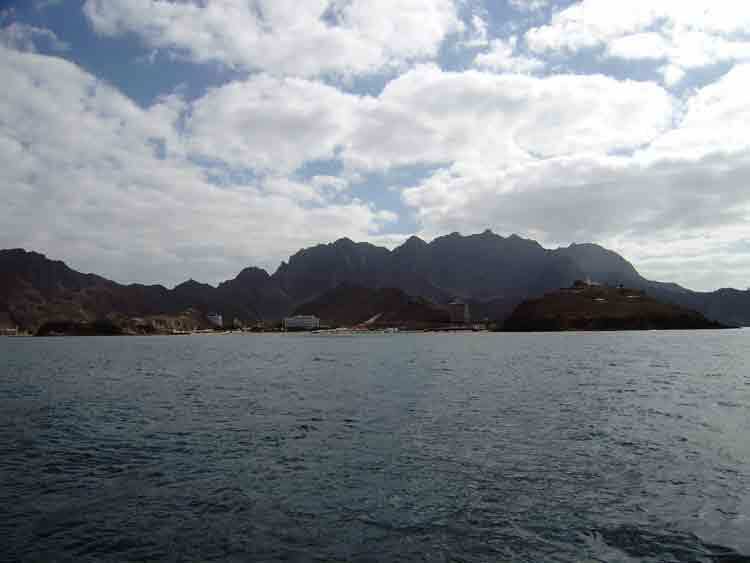 We had a good sail all the way to Aden harbour but again the skies were cloudy. We missed the full glory of the approach to the harbour. All the other rally yachts were already there and as soon as we were anchored and the dinghy launched we were off ashore to start the usual processes of immigration, customs, re-fuelling, water, laundry, gas, etc. Everyone was very helpful and we were soon whisked off in a taxi to a new shopping centre with a big supermarket and ATMs. Apart from the usual chores we had two priorites while in Aden. 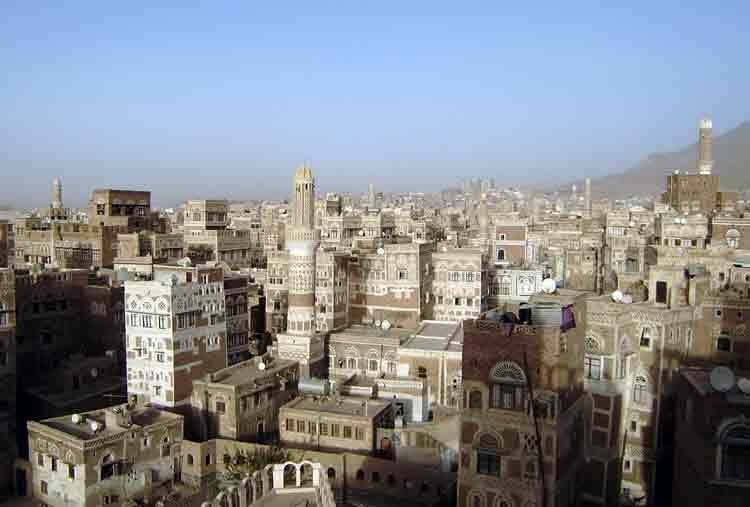 One was to get our replacement wheel pilot (parcel due Sunday or Monday) installed and the other was to visit the capital, Sana'a. However, time was tight because of the delays getting out of the Red Sea, the rally is now behind schedule and some of the rally boats needed to press on to Oman to meet crew arriving there. So, we spent the next morning getting permission from the harbourmaster, organising visas and air tickets to fly to Sana'a last Sunday evening. The plan was to get back and pick up the wheel pilot on Tuesday morning, install it in the afternoon and leave on Wednesday morning. 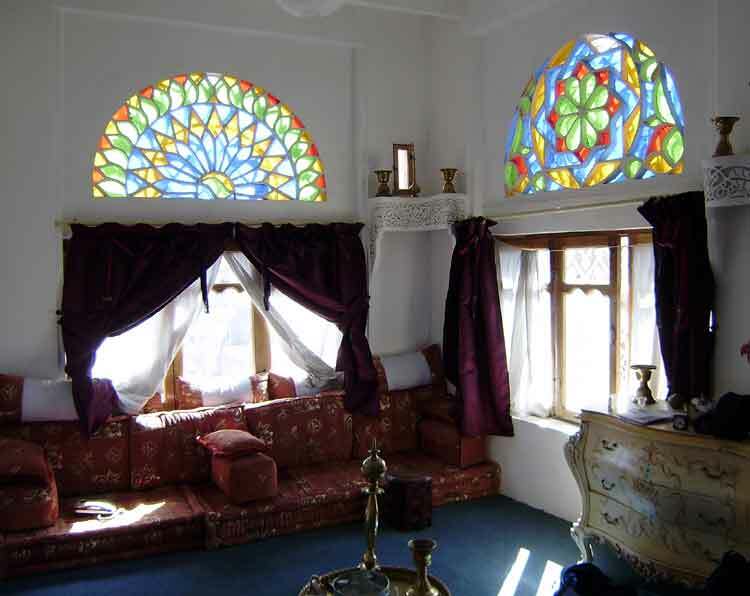 Our visit to Sana'a was just perfect. We didn't have time for the 7 hour bus ride and maybe the views would have been wonderful but the 45 minute flight and taxi ride into the old town went smoothly (despite our taxi driver getting lost in the narrow streets). We stayed at the top of one of the tower houses with views of the city all around us. Being in the mountains the skies were clear and the evenings cool. We spent the day exploring the old town, sampling the local cuisine, buying souvenirs of myrrh, frankincense and other exotic things. Everyone was friendly and welcoming. 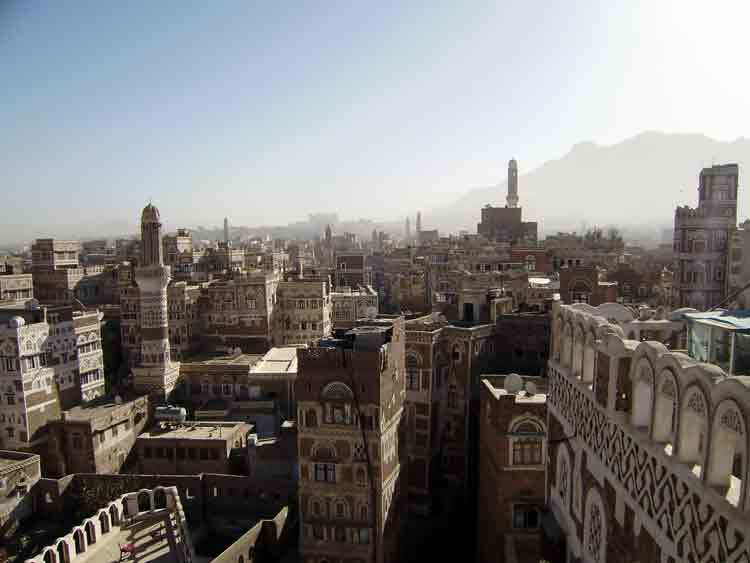 Yemen is a relatively poor country, but in many ways more interesting than the other Arab countries we've visited. We arrived back in Aden on Tuesday morning ready to collect our parcel. Frank and Marika on Sepia had contacted the agent in our absence and established that the parcel had arrived in Aden so we were full of optimism. 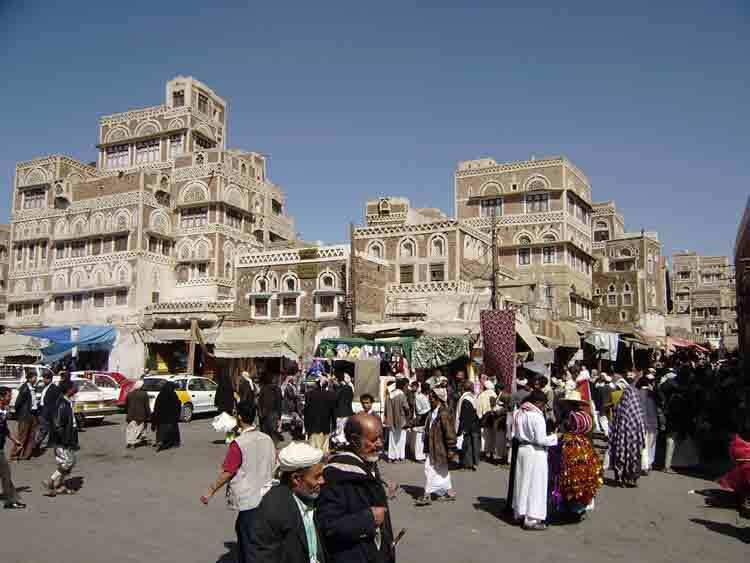 We soon found there was a small problem as when passing through Sana'a a tax of 300 US dollars had been added to the paperwork. The officials in Aden accepted we were exempt being a "yacht in transit" but needed an exemption certificate from Sana'a. By this time it was early afternoon and despite all manner of negotiating we could not get anyone to fix the problem. In Yemen, getting anything done in the afternoon can be a trial as most of the male population are settling in to their Qat-induced highs sometime after mid-day. They buy the fresh leaves from the market around noon and then settle down on a mat somewhere, in a back office if working, or a cafe, or even on the pavement, chewing the leaves into a large ball in one cheek. Maybe it explains the generally easy-going nature of the Yemeni people? Not getting our parcel on Tuesday meant that we couldn't leave on Wednesday. We had all planned to leave together and travel in convoy through the next stage where there is some risk of piracy. On Wednesday four yachts left in one convoy and the rest waited another day. We were at our agents at 8am and with 2 helpers we managed to get our parcel cleared and back to the boat by the early afternoon. By 9pm we had the new wheel pilot installed (after a fashion), got our last minute shopping and secured the necessary port clearance certificate from the harbourmaster. A little tired we were ready to leave at 8am on Thursday, along with the other 9 remaining rally yachts. The wind was light and against us so we motored most of the passage along the coast to Al Mukalla. 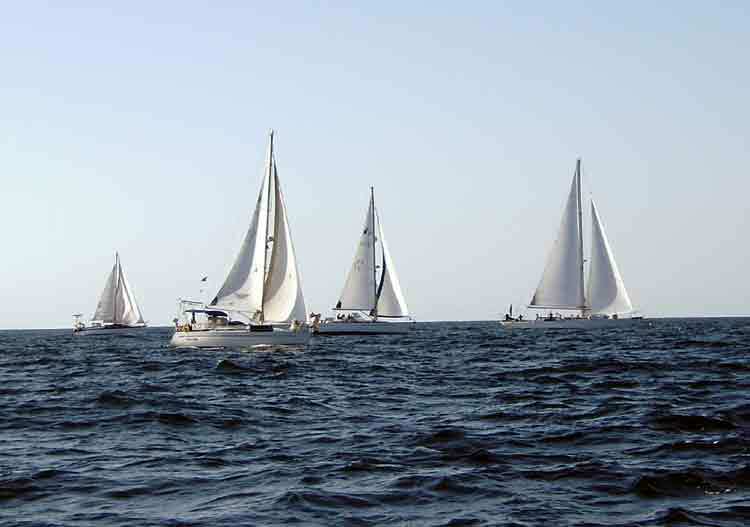 One of the difficulties of sailing in convoy is that every boat is different. Some of the yachts could achieve 4 knots in light winds but we could not so had to motorsail to keep up. Once motorsailing we would have preferred to make 5 knots. When the wind dropped back and the others were motoring, they were able to motor over 5 knots while we have difficulty in maintaining much more than 4 knots in comfort. So it was not a very comfortable 300 mile passage. We didn't see any pirates, just a few fishermen inshore and large ships passing further offshore. Some of the yachts had problems with floating fishing nets inshore and Mailys' little dog fell overboard at one point. We are all happy to be in Al Mukalla and past the piracy risk area so we can now continue to Oman at our own pace.